1 - Know what not to shoot. 2 - Avoid the technical trap. Keep it simple. 3 - Always go on Photowalks alone. You get the best shots. 4 - Shoot a theme each time you are out. 5 - Use color to your advantage. 6 - Look for shapes. 7 - Shoot anytime during the day. Don't restrict yourself. 8 - Shoot with different lenses at the same location. 9 - First compose in your mind. 10 - Use the rule of thirds. 11 - Location advantage. If you can go to a place other photographers don't have access to, you have an advantage. 12 - Watch tutorials on YouTube. 13 - Post you work on at least 1 sales website like FineArtAmerica. 14 - Create your Blog/Website and post regularly. 15 - Be present on at least 2 Social Media platforms and post regularly. 16 - Focus more on Creation rather than on Selling or Commercial angle or else you will spoil your work. 17 - Visit Photography and Art Exhibitions. Give you fresh perspective. 18 - Organize your own Photowalks. 19 - Avoid too much Feedback. You know what I mean. 20 - Learn from other Photographers. Don't let your ego stop you from learning. 21 - Never delete old work. Never. 22 - Take a back up of your Photos at least once every 15 days at 2 more places other than your computer. 23 - Do not Over Edit. 25 - Set image size to Highest Resolution. Helps in case you need to Crop. 26 - Review your edited photos over a number of days after editing, maybe you are able to edit them better on a later date. 27 - Pass on leads to other Photographers :) Yes, pass them on. 28 - Don't fall in the Narcissism Trap. That would be the end of your career. 29 - Don't succumb to Societal Pressure. Keep working hard, it will yield results if you are earnest. 30 - Never work for Free. Never. 31 - Consider prevailing market prices before quoting your price. 32 - Go out on a photowalk without the camera once in a while and simply compose with your eyes to practice. This helps, take my word for it. 33 - Get inspired by others work but do not get over inspired, copy and lose your originality. Beware. 34 - Shoot all styles to begin with and pick one genre that your feel comes naturally to you. 35 - Never depend totally on the on-screen / LCD review of the camera. Check technical specifications after shooting by pressing the Info Button and zoom in to check how sharp the photo is and whether you have missed focus. 36 - Get a Camera and Lens Cleaning Kit. Clean regularly. 37 - Never change lenses with the camera power button on, make sure the Camera is turned off when you do so. 38 - Use a Lens filter to protect the lens. Like a a good quality UV filter on top of your lens. 39 - If someone objects at you taking a picture of them or their house, find another place or subject. Don't offend them. 40 - Always keep an eye on the traffic. Safety first. Its OK if you miss a shot. 41 - Shoot mostly one stop under exposed, it helps during editing. 42 - Don't be in a hurry to be successful - if you can't give 6-7 years to photography, it better to stay out. Art requires time. 43 - Your garden / terrace and your backyard has many shots hidden in them. Go explore. You will be surprised with what you find. 44 - Go out post a rain-shower and shoot some Water Reflection photographs / Water droplet photographs. Try Water Reflection photography once, you will love it. 45 - Keep an eye on the Cloud formations in the sky. Some days they are a good starting point. 46 - Go to public places like Malls, Airports, Train Stations and Bus Stands to shoot (if allowed). They are full of interesting subjects and architecture. 47 - Go to places, most photographers don't go. Your shots will be different as a result. 48 - Use a hand strap for your camera, as surrounding your neck with your camera belt can cause neck strain/injury. 49 - Go out in the rain to shoot rather than staying back home using rain as an excuse not to shoot. 50 - When it is raining, find a shed, position yourself, put on the lens hood and protective gear and shoot. 51 - Take written permission before shooting at public places like Airports, Train Stations etc to avoid trouble. 52 - Never shoot with your Mobile Camera when you are out with your Digital Camera. 53 - Keep Silica Gel sachets in your Camera Bag to protect your camera from moisture. 54 - Remove Battery from the Camera after use. They will last longer as a result. 55 - Cropping a photograph can carve out a nice frame for you, if done the right way. If you found the tips useful, consider sharing the article. I went to Anchor Mall one day to click some pictures. At the entrance of the Mall, which is located at Ajmer Road near my house, the guard came up to me and uttered those famous words that I hate to hear "Sir, Photography is NOT Allowed." I was devastated. I have seen other photographers who had posted nice shots from within the Mall with Phone Cameras. This brown wall was to my right above a Pan Shop/Kiosk. I got interested looking at the Two Windows. I could see blue sky through both of them. 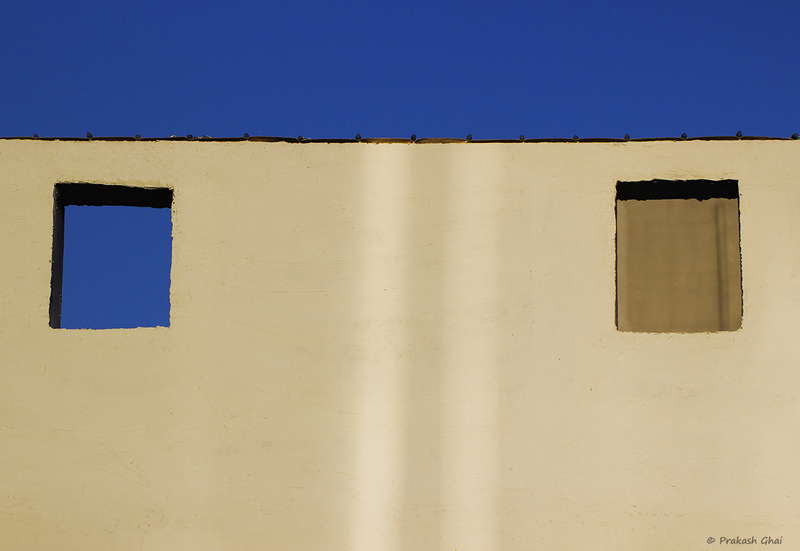 So I captured my initial shot in which both Windows had Blue Sky visible through them. While I Was about to leave, I realized that with a little movement of my feet, I was able to get a Brown Wall of a nearby building in the window on the right, matching the color of the wall and thus making the Window appear closed. 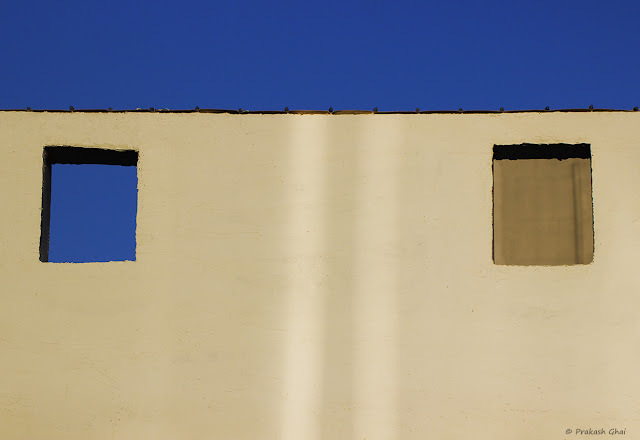 I decided to shoot this composition with "Opposites" as a theme in my mind in which one Window can be seen as Open and the other one Closed. Hope you enjoyed the Open Vs Closed Window Minimalist Photograph. 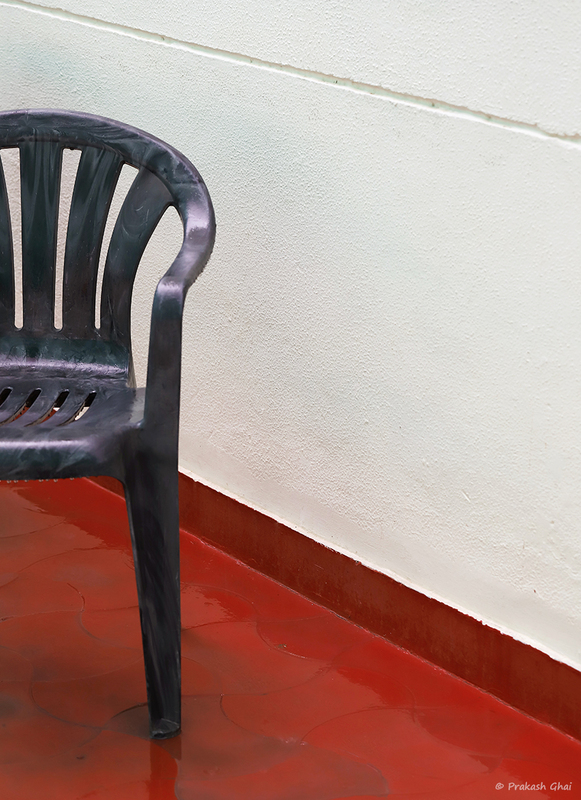 This Chair against the White Wall was spotted near the Swimming Pool Area at Jaipur Club Ltd. I carefully clipped the chair into approximately Half, so as to fit this Photograph under the Minimalism as Parts of the Whole Category of Minimalism. The Two Diagonal Lines i.e one at the Top in the White Wall and the one made by the floor partition adds further interest in the picture. Hope you enjoyed the Chair and White Wall Minimalist Photograph. 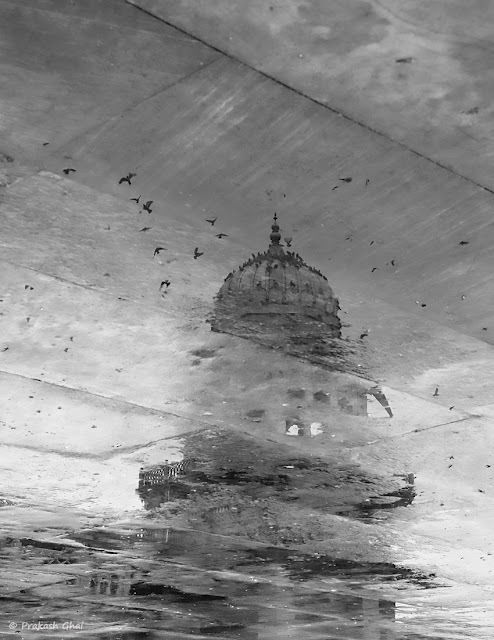 This Albert Hall Tower Photograph was shot on a Rainy Day. This image is actually a water reflection image of the Tower along with the flying birds as seen in the reflection. 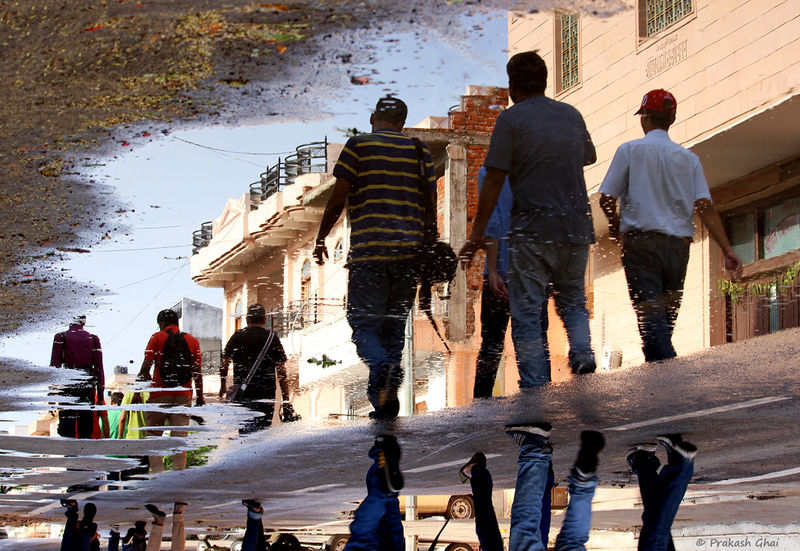 I have flipped the image upside down. The Photo falls under the Minimalism as Low Detail category of Minimalism. The elements are clearly less and the detail is low, some parts are left to users imagination. 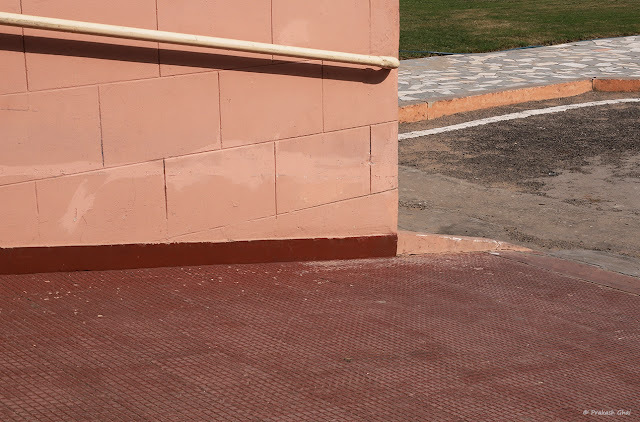 I am posting a photo of Minimalism as in Low Detail after a long Time. You feedback will be good to have. Hope you enjoyed the Albert Hall Tower Minimalist Photograph. This Glass Door that I captured is near Jaipur Club Health Club. One fine rainy day I was going out to shoot pictures. It suddenly started raining hard and since I was on my bike I decided to stop at Jaipur Club till the rain subsided. I usually never carry my Camera there but that day I did and to my surprise I got a few decent photographs. and that reinforced my belief that "You can find a Minimalist Picture literally anywhere"
I liked the pattern on the Glass Door and a hint of Gloss. 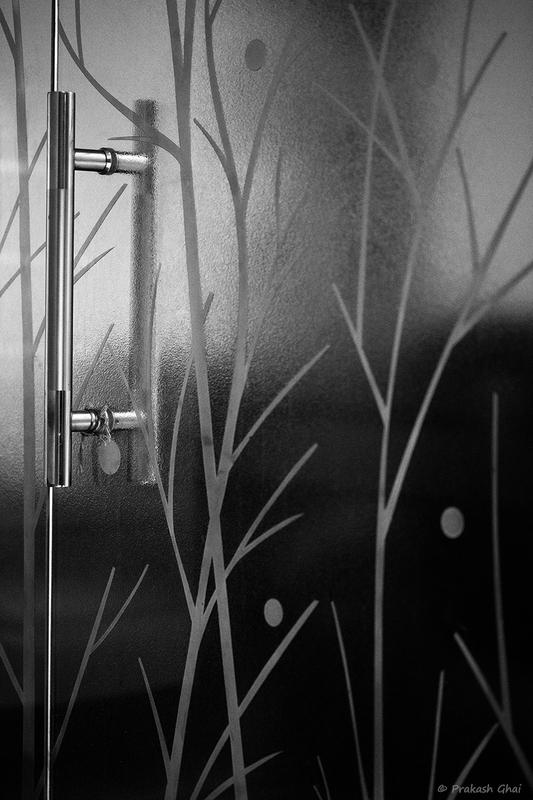 Hope you enjoyed the Glass Door in Black and White Minimalist Photograph. This Sunday I went to Birla Auditorium that host shows/ seminars on astronomy and science. Some people also call it Birla Planetarium. Hunting for Minimal Art Photographs, I even reached this place. I did not think I would find any shot here though. But I did spot the Side Rail Bar near the sloping Parking Area climb. From there I started building my shot. After a couple of clicks, I added some more Lines to compliment the Railing Bar and its shadow. I mean the lines in the Top right section. Yes, those are Complimentary Lines. Most of the Photo is Simple Geometric Lines and there categorized into Minimalism as Less Elements. Hope you enjoyed the Railing Bar Shadow and Lines Minimalist Photograph. I had been trying to shoot this kind of perspective for a while now. 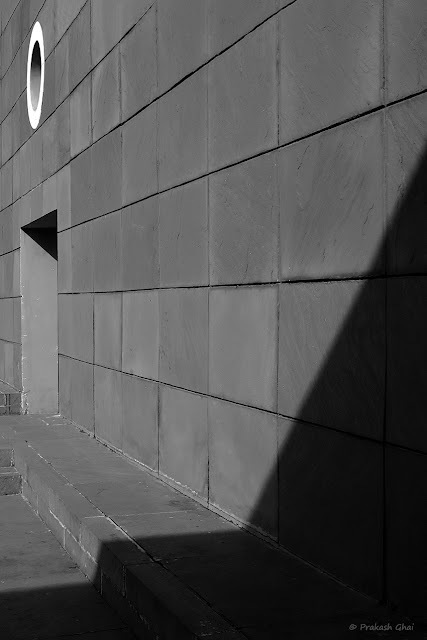 I tried to shoot such a frame at different places at Jawahar Kala Kendra. Finally, this frame made it to my blog. The reason being, I have a clear Subject i.e the Circle and a complimentary Subject aka the Door. Also there are clear Leading Lines and the big Shadow Patch adds even more interest to the composition. Hope you enjoyed the Distant Circle and Door Minimalist Photograph.